At this point in my mom career / tenure the going back to school routine is somewhat old hat. I'm not super emotional about it, more like "take my child please". But in many ways this year is a bit different in that both kids will be attending "real school" and are now officially on the same calendar schedule. This works out well for days off and holidays. But as with all things it's kind of bittersweet. The mom struggle is that you're torn about summer break. You both love and hate it. Love the relaxed schedule, lack of homework late nights and ability to do what we want when we want. However, being a work at home mom during the summer can be a bit......stressful at times. For me, there is a lot of putting my work on the back burner and finding ways to keep the kids out of their rooms, off their devices and out of each others hair. Chauffeuring children to and from lessons, play dates. Going on adventures. It's a full-time job yo. Summer break also means a lot less time with my mama friends. With everyone in and out of town it can be hard to plan get-togethers and your usual mom squad can go weeks without contact. Which can throw off your balance and make any mama feel a little isolated. Thus making going back to school a bit of a celebration. And what is a celebration without libations? A sad meeting that's what. 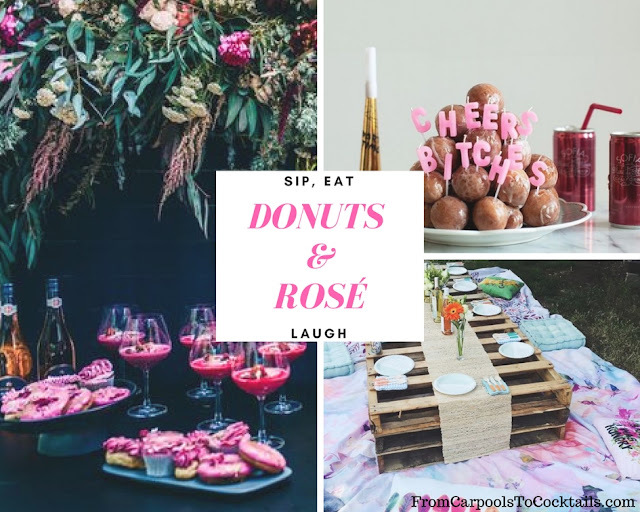 Y'all know I am all rosé all day over here so it stands to reason that back to school should be celebrated with donuts + rosé ! Your Favorite Rosé: for a gathering of the girls I like to either chill a bottle of Sofia Coppola and Whispering Angel or break out the cans for easy portability! Donuts: All shapes sizes and flavors. Eff your Whole 30 it's mama time. Your Mom Tribe: Call your mom squad and pick a date so you can all celebrate the return to normalcy, say peace out to summer and hash out your concerns over the upcoming year. Super simple and you'll still have time to run a quick errand before picking up the kids! How do you celebrate / commiserate the return to school and say good-bye to summer?